Selling your car can be quite an emotional process but while you may have experienced many good times together, this process is a lot easier and more productive if you can put these feelings aside. In this regard, you must realize that potential buyers will look at your car in a very practical manner and with little concern for the sentimental value it holds for you. Condition – How does it look? Is the car missing anything important? Is the paint work clean and body without any bumps or scratches? Potential suitors will also want to know if the vehicle has suffered any accidents and request to see the damage caused. Interior – Does the interior feel new or can it be cleaned up until it looks this way? Buyers will value the interior of your car just as much as how it looks from the outside. Tires – One sure way of reducing the value is to leave an old set of tires on the vehicle. Consider replacing tires which are old or worn and ensure vital aspects such as the brakes are working fine. Every manufacturer and model is made for a specific reason, to be different, and this is one way in which you can go about increasing the asking pricing. If the car in question is a particularly popular model known for being reliable, the price will increase. Likewise, any special modifications or features such as a spoilers, sunroof or even a sound system should be taken into consideration. Obviously finding the current asking price for a new car is quite easy but for used vehicles, the best way to come up with a valuation is to assess the asking price for similar models online before comparing the relevant specifications and conditions of the vehicle with your own. Selling your car can be quite a stressful process at the very least. Potential buyers waste time while the questions keep coming and this can be most peoples’ idea of their worst nightmare. Furthermore, there are technical issues such as taxation often needs to be covered after the sale of a vehicle. That being said, the most inconvenient part of selling your car is usually the time and effort it takes to produce photographs, advertise, answer phone calls, meet potential buyers and then finally, negotiate the price. Yes, the process is indeed both exhausting and time consuming which is why private dealerships are often a better option as they take care of everything from start to finish. However, many car owners will still pursue a private sale in hope that they can make a better sale than the professionals. In this instance, you will need to put in the time mentioned above and a good place to start is with the overall appearance of the car. From external scratches or paintwork to dirty set covers and faulty seatbelts; all of these details need attention and will absolutely determine the amount of which you can get for the sale. Many professionals request a substantial fee for writing even a short advert but if you want to write this yourself, then by all means do so. Featuring important information such as the mileage, condition and number of owners, this advert should be concise but also transparent and not misleading in any way. Every destination and region will have a dedicated place to sell vehicles online and most of these require a small fee for the privilege. For reasons of trust and safety, many buyers like to visit a private dealership to check out a vehicle but there is certainly a very large online market for used cars and a quick Google search should located the right one for your circumstances. Although this can be quite a nervous encounter, it works both ways and the buyer is usually feeling the very same way. However, this is really no time for emotions and it is always best to focus on this as an everyday business transaction. Most buyers will arrive with the intention of reducing the asking price but even if this sounds reasonable, you should wait as long as possible before changing this price, without frustrating the buyer. As a rule, focus on all the strong aspects and positive performance of the vehicle and never sell unless you are completely happy with the amount being proposed. Selling a vehicle is only possible once all the necessary paperwork is to hand. If you still have the previous sale receipt and maintenance history, this will be a hugely encouraging sign for interested parties. However, there is obviously paperwork such as the actual bill of sale and warranty forms which must be presented before any money can be exchanged. Whether you choose to trade with a local dealership or opt for a private sale, remember that the successful sale of any product or service requires effort and patience. 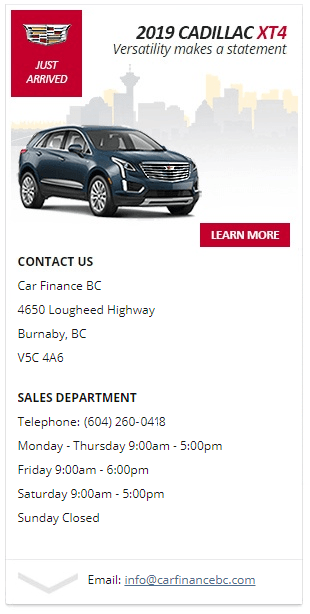 By submitting your email address or phone number, you allow us, Car Finance BC, to include you on our contact lists to send you information about our products, services and promotions. You may revoke consent at any time by clicking on the "Unsubscribe" link in your email.